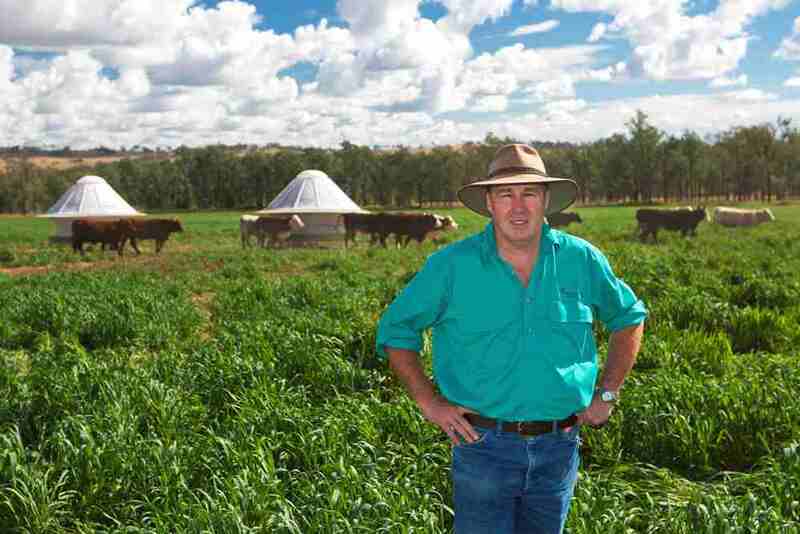 One of Australia’s largest private cattle producing companies has won ACCC approval to create a new Certified Trade Mark for “free range grain and grass fed beef’. The trade marked certification logo approved by the ACCC. Click to enlarge. The application by Ceres Agricultural Company was opposed by several industry organisations including Cattle Council of Australia (CCA), the Australian Lot Feeders Association (ALFA), the Australian Meat Industry Council (AMIC) and AusMeat. Ceres Agricultural Company turns off in excess of 100,000 MSA-graded cattle each year from 15 properties and a 5000 head feedlot in NSW. It describes itself as Australia’s largest red meat producer “utilising a hybrid feeding model”, which involves growing and finishing cattle on grass with unlimited access to supplementary grain rations in the paddock. In opposing Ceres’ application, industry groups argued the use of ‘grainfed and grassfed’ in the proposed Trade Mark would be misleading to consumers, because hybrid grass and grain production systems did not meet the minimum requirements of existing industry grassfed or grainfed certification programs. Consumers were prepared to pay a premium for grassfed product, the Cattle Council submitted, and it would be a concern if products produced under a ‘grain and grass fed’ system could be marketed as grass fed, when they had clearly had access to grain. ALFA told the ACCC there is strong industry consensus around the description of products that are unable to be certified as grass fed or as grain fed. National Feedlot Accreditation Standards (NFAS) required that beef must have been produced from cattle fed in an NFAS Accredited Feedlot for not less than 100 days to be called ‘grainfed beef’. AUS-MEAT said it was important that beef labeled as ‘grain fed’ be sourced from production systems consistent with this long-established industry-accepted definition of grainfed beef. The industry groups argued there should be a single set of standards adopted by the entire industry and prescribed by law. “The ACCC does not consider that use of the ‘grain and grass fed’ descriptor would suggest to consumers that products bearing the Ceres CTM are compliant with these other grain- only or grass-only standards,” the ACCC wrote in its judgement. “The proposed Ceres CTM descriptor is very clear in describing a hybrid grain and grass fed production system/diet. “It is clear from the descriptor that the cattle’s diet is not based on a solely ‘grain fed’ or solely ‘grass fed’ production system or diet. “The ACCC considers that in this respect it is unlikely to be construed by consumers as conveying that either a grain fed production system such as the Minimum Grain Fed Standards or a grass fed production system such as Pasturefed Cattle Assurance System (Certified Pasturefed) has been used to raise the cattle. Approval of the CTM by the ACCC only relates to use of the CTM in Australia. Ceres Ag’s Mark Mason in one of the 300 pasture-based finishing cells at Gunyerwarildi, near Warialda. Ceres Agricultural Company manaing director Mark Mason said the company was “very pleased with the outcome and the opportunities it will create for us”. Ceres Agricultural Company initially applied to register a ‘Certified Free Range Pasture Finished’ CTM but amended it to “Certified Free Range Grain and Grass Fed” CTM to address concerns raised by the ACCC. 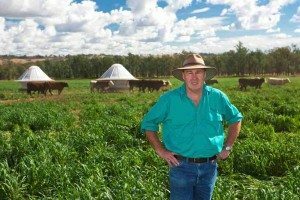 In August last year the ACCC issued an initial assessment proposing to approve the ‘Certified Free Range Grain and Grass Fed’ CTM. Following a public consultation process the ACCC issued a final assessment approving the CTM on December 21 last year. As a result of the ACCC approval, the Registrar of Trade Marks at IP Australia advertised its acceptance of the “Certified Free Range Grain and Grass Fed” CTM last Thursday, February 8. There is now a two month opposition period where parties and members of the public can oppose the registration of the CTM. If no party objects, it becomes a registered CTM. Ceres has previously explained that its ‘hybrid’ production system enables it to turn off large volumes of consistently high quality beef at a fraction of the cost of conventional grain feeding systems. The company estimates that similar production systems are used by the majority of the 60,000 plus cattle producers in Australia, and says producers, processors and retailers have long indicated a market demand for a certification scheme for hybrid feeding options. There has certainly long been a debate about whether beef from this vast “middle ground” of cattle that are not pure grassfed or pure grainfed should be able to be branded or marketed under terms such as ‘grain assisted’ or ‘grainfed and grassfed’ for example. The issue draws fierce debate from proponents on both sides whenever it emerges. Lot feeder and former ALFA president Kev Roberts has argued that lot feeders “fought bloody hard” to be able to use the term grainfed to differentiate their product as a clearly defined segment, underpinned by rigorous standards and independent third-party audits. However others have argued that this is an important truth in labeling issue: Don’t consumers have a right to know how a product was raised, and whether a piece of beef originated from cattle there were 100pc grassfed, certified grainfed, or raised on a mixture of grass and grain, they ask? Ceres Agricultural Company says it has been working with the industry to try to develop a certified trade mark for hybrid feeding systems since 2005. The company said it was advised in 2014 by MLA to ‘go it alone’, because there was no industry funding available for such a program, nor was there an appetite within the industry to establish any form of differentiation for grain assisted type cattle, despite producer and customer interest. Ceres said in its application the industry had had years to develop such an initiative. After working with other producers to engage with industry groups and motivate them to undertake such an initiative, Ceres said it had lost patience and decided to pursue a certification system of its own. Ceres Agricultural Company told the ACCC its proposed ‘Free Range Grain and Grass Fed’ Certification Trade Mark will provide a meaningful standard to differentiate the vast majority of products within the red meat industry which are produced on a hybrid pasture and supplementary grain feeding model. It was developing the mark to meet market demand and ensure consumers have access to clear information regarding the feeding system used in production. Ceres Agricultural Company managing director Mark Mason told Beef Central that other producers will be able to sell their cattle under the trade mark provided they comply with the production standards that underpin it. The program will also be independently third-party audited, he said. The system would require participating producers to meet requirements that ensure the health and welfare of cattle, allow cattle to roam in a free range environment, confine cattle only for purposes of health and welfare rather than intensive production, and to access a diet of both grain and pasture to ensure optimum performance and health animal health and welfare outcomes. It would also have requirements surrounding environmental, traceability, eating quality and food safety outcomes. Other versions of the trade mark would allow further differentiation along breed lines and or further raising claims such as freedom from HGPs and/or antibiotics. The ACCC noted in its review that industry had over the past two years, through the Australian Meat Industry Language and Standards Committee, developed an Animal Raising Claim Framework for Beef Production Systems in Australia in consultation with all sections of the industry. This would include a new “Fodder Fed” standard to cover the type of production systems contain in the Certified Free Range and Grass Fed CTM rules. The ACCC said it noted that Ceres’ work to develop its standard pre-dated the establishment by industry of the Fodder Fed standard. “The ACCC considers that producers should be able to compete by innovating or differentiating themselves by establishing, adopting and/or promoting different standards provided that the CTM rules accord with consumer expectations about what the CTM means. The ACCC noted in its summary that there is currently no prescribed standard for grain fed or grass fed production systems concerning beef cattle raised for domestic consumption. The ACCC said it was not its role to choose between different sets of standards. It said it was satisfied in this case the Certified ‘Free Range Grain and Grass Fed’ CTM rules provide that cattle are free to roam in open pastures most of the time while consuming a mixed diet of grain and grass. “Industry through the Australian Meat Industry Language and Standards Committee (AMILSC) continues to engage with the ACCC to ensure that the Australian red meat industry standards are well understood and utilised appropriately in our domestic and export markets,” Mr Bloxsom said. How many magnificently finished cattle have been sold through yards or direct over the years, and not gained the premium they and there manager deserve. Processors will weep in there cups. Creates the impression of cattle standing in high-grade waving pasture and happily eating away then sauntering up to the grain bin for a little grain. But is this always the case – maybe, maybe not. At least the ACCC has showed common sense i to some years ago had bullocks on oats & grain bins at opposite ends of the paddock to the water trough was very successful.In 2003 at Beef Week at Rockhampton they had a tasting competition 0,2,4,6,&8 teeth bullocks the 8 tooth won by a mile not just on tenderness but the turning point was the flavour,I’m not advocating eating 8 teeth bullocks again but the flavour taste maybe why we’re losing ground to other proteins.0 & 2 teeth might be tender but most times not a lot of flavour. Let’s look at the animal’s perspective and tie it into the business model. Efficient conversion of pasture to muscle, by ruminants, is controlled by the rumen’s capacity to ferment and the liver’s efficiency to metabolise. Maximum intake of pasture is usually controlled by gut-fill. By always topping up the animal’s daily diet with a small amount of fermentable carbohydrates (grain), the rumen becomes more efficient and the animal can eat more. That fixes the main limitation in beef production off pasture; restricted dry matter intake. There are multiple advantages for the health of the business and the animals. These are too numerous to list here. Basically, this model will consistently produce more kg beef/ha. As a bonus, animal health and welfare can be better managed. From a whole industry perspective, it is now even more important to clear up the differentiation between forage-fed, grain-fed and hybrid systems. They all have a place. Our energy should be focused on increasing beef production and sales to domestic and export customers instead of in-fighting within the industry. This is what happens when you start creating marketing terms under a law. The whole point of marketing is to aim for the purchaser who chooses to be less knowledgeable on what they are buying and you become very selective on what you say. I doubt I have ever come across a fully frank and honest marketing campaign. So what do we call cattle that have been finished on Leucaena? Is it not a grass and not a grain? What about molasses? It comes from a grass, but it is not a grain? Common sense needs to prevail and those with a niche product should not be allowed to make it so they lock other producers out of a broad generic marketing term just because they do not conform to an individuals opinion. Great article James. Excellent coverage of view points. Grass Fed Beef is an oxymoron. You need to feed cattle grain, to make them eat it, initially. You do not need to fed cattle grass – they do it naturally, they are ruminants. Just in ‘our’ quest to make beef faster, softer, cheaper (yes, in the USA on corn) we found ways to essentially ‘force-feed’ cattle, then marketed it as ‘better’. So beef from cattle in their basic rangeland, with their ‘paddock range’ grass, herbage and browse eating behaviour, should not be called grass fed. The term GRAZEN seems more appropriate; the cattle have chosen to graze, to eat out there in paddock choosing some grass here, some fallen tree leaf there, some seeded grass head in the gully; exhibiting normal bovine behavior in their mob but choosing what to eat of the naturally growing pastures and fields in front of them as an individual animal. It is all this natural behaviour that produces the ‘clean, green’ meat we’re so proud of. The continual push for changes to make these cattle grow their bulk, their muscle, faster, cheaper, softer, easier; then market it as somehow ‘better’; this is the con that confuses the customer. So can we enter the twenty-first century, have some truth, honesty and transparency, be consumer focussed. Ah, that brings in a post-Weinstein request, can the de-voiced females whom cook most of the beef in the world and consume just under half, become part of this conversation, debate and production sometime soon please. It only seems fair, right and proper.